The editor who rejected Lee's first effort had the right idea. The novel the world has been waiting for is clearly the work of a novice, with poor characterization (how did the beloved Scout grow up to be such a preachy bore, even as she serves as the book's moral compass? ), lengthy exposition, and ultimately not much story, unless you consider Scout thinking she's pregnant because she was French-kissed or her losing her falsies at the school dance compelling. The book opens in the 1950s with Jean Louise, a grown-up 26-year-old Scout, returning to Maycomb from New York, where she's been living as an independent woman. Jean Louise is there to see Atticus, now in his seventies and debilitated by arthritis. She arrives in a town bristling from the NAACP's actions to desegregate the schools. Her aunt Zandra, the classic Southern gentlewoman, berates Jean Louise for wearing slacks and for considering her longtime friend and Atticus protégé Henry Clinton as a potential husband—Zandra dubs him trash. But the crux of the book is that Atticus and Henry are racist, as is everyone else in Jean Louise's old life (even her childhood caretaker, Calpurnia, sees the white folks as the enemy). The presentation of the South pushing back against the dictates of the Federal government, utilizing characters from a book that was about justice prevailing in the South through the efforts of an unambiguous hero, is a worthy endeavor. Lee just doesn't do the job with any aplomb. 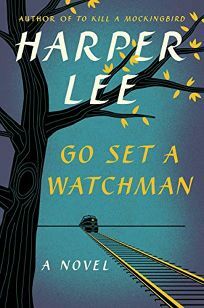 The theme of the book is basically about not being able to go home again, as Jean Louise sums it up in her confrontation with Atticus: "there's no place for me anymore in Maycomb, and I'll never be entirely at home anywhere else." As a picture of the desegregating South, the novel is interesting but heavy-handed, with harsh language and rough sentiments: "Do you want them in our world?" Atticus asks his daughter. The temptation to publish another Lee novel was undoubtedly great, but it's a little like finding out there's no Santa Claus.